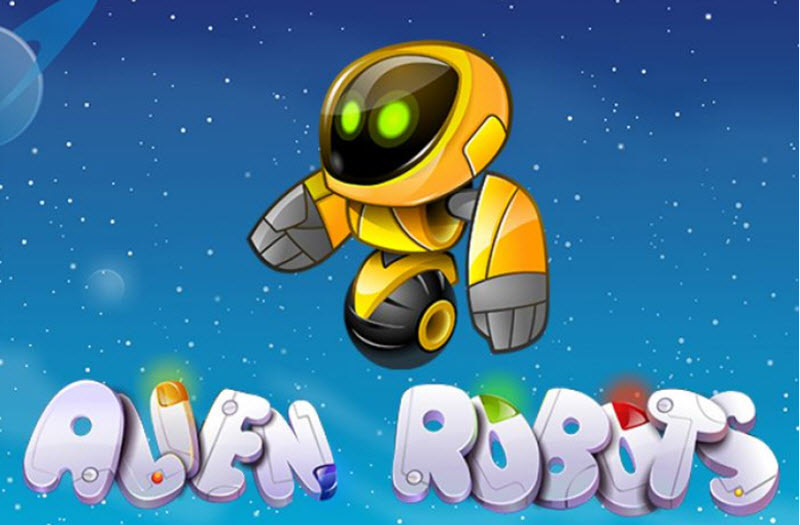 Alien Robots is a space-themed slot machine from the Swedish game developer NetEnt. Interestingly, you get to chose between 30 traditional paylines or 243 winways. There is a free spin round, but no interactive bonus round. During free spins, the wild symbol is extra powerful and can expand, freeze and cause a re-spin. The theme for Alien Robots is robots in outer space. Example of symbols that can appear on the reels are Security Robot, Construction Robot, Baby Robot, Robot Dog, Robot Servant, and the spaceship. When you play Alien Robots, you get to chose between having traditional paylines or being able to win in 243 different ways. If you chose to play with traditional paylines, you get to select how many to activate (bet on), from 1 to 30. You can only win on active paylines. You also get to select how many coins to bet per active payline: 1 coin, 2 coins, 3 coins, 4 coins, or 5 coins. The highest possible win on a single payline is 10,000 coins. If you chose to play with 243 winways, a so called bet multiplier will become active, and it is a 60x bet multiplier. This means that the smallest possible bet is €0.01 coin value x 1 coin x 60 bet multiplier = €0.60 per spin. The largest possible bet is €0.50 coin value x 5 coins x 60 bet multiplier = €150. The largest individual win is 1,500 coins. The wild symbol consists of a robot and the word WILD. The wild symbol can substitute for any of the regular symbols to form winning combinations, but it can not substitute for the scatter symbol. 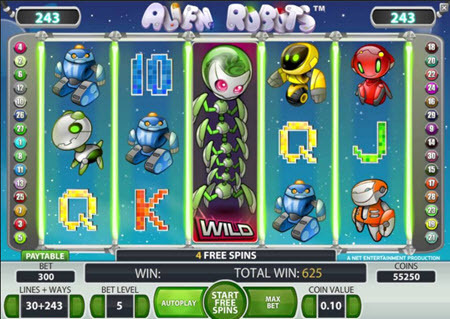 Your key to the free spins mode on Alien Robots is the spaceship (flying saucer), which is a scatter symbol. You need to get at least three scatters, any where on the reels, to start free spins mode. When in free spins mode, the wild symbol is extra powerful. When the wild symbol helps form a winning combo, it will expand and cover the whole reel. Then, the other reels will spin again, giving you a new chance to win.